Orlando, FL (February 28, 2018) - Aktion Parks is pleased to announce the official grand opening of Central Florida’'s first inflatable Aquapark. The celebration will be held on Saturday, March 24th from 12:00PM – 4:00PM at Orlando Watersports Complex (OWC). Bring out the entire family and join us in celebrating OWC’'s newest attraction with a live DJ, free food, drinks, and giveaways. 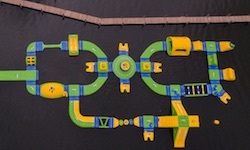 The Aquapark concept is inspired by LEGO blocks, featuring a modular series of interlocking climbing obstacles, pathways, slides, and trampolines, allowing for endless fun for all ages. “"The grand opening of the OWC Aquapark will be a momentous event for people of all ages and I’'m incredibly proud of the team at Aktion Parks for making this dream a reality. I am personally very excited about spending time on this new attraction that will introduce more people to our world-famous cable park",” stated Bill Yeargin, CEO of Correct Craft (owner of Aktion Parks). The OWC Aquapark will be open to the public starting Sunday, March 11th from 11:00AM - 5:00PM daily throughout the month of March. Book your Aquapark session in advance so you don’t miss out on all of the fun. Click here to schedule. The event will be held at OWC, 8615 Florida Rock Road, Orlando, FL 32824 located off Landstreet Road. Click here for directions.